Kotgarh, the apple bowl of India, is situated 82 km from Shimla on the old Hindustan-Tibet road. Located about 6,500 feet above sea level, it is famous for its apples and acres of apple orchards. 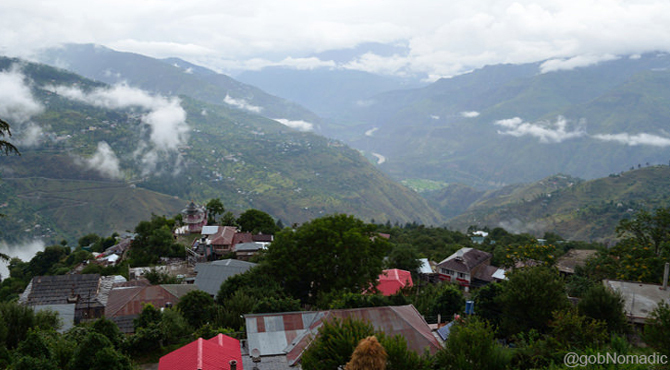 Kotgarh is just 16 kilometers from National highway that heads into the valley through Kumarsain, Rampur and Kinnaur. The region was overrun by Gurkhas and in 1815, British defeated Gurkhas and thus Kotagarh became a British territory. The British government encouraged missionary work in Kotgarh and became a mission station along with Simla, Kangra and Dharamsala. An ideal holiday resort, Kotgarh is famous for not only its scenic beauty but also for its apple cultivation in the Shimla hills began in the early 1900. An interesting story behind the apple revolution in Kotagarh. Once a poverty and unproductive area, Kotagarh is now considered as one of the most wealthiest regions in Himachal Pradesh. In 1916 Samuel Stokes, a social worker from Philadelphia, USA came to Kotagarh as a missionary worker. Even though he was involved with the spreading of Christianity, Stokes attracted the beauty and the culture of Kotgarh and eventually settled down. He married Agnes Benjamin, a local Rajput Christian teenager. Even though he came to Kotgarh as a missionary worker, he converted from Christian to Hindu and changed his name to Satyanand Stokes. In Kotgarh, he cultivated delicious variety of apples in his farm, which he imported from the famous nursery Growers- Stark Brothers of Louisiana. He encouraged the local farmers to plant apples in their fields thereby bringing prosperity to the people. The apple trees which he planted continue to reap a rich harvest even 100 years later. One can still see the 'Starking Delicious' apple orchard that he planted here. Kotgarh is a quaint scenic place. It offers marvellous walks through pine forests and Apple orchards. The picturesque terraced fields dotted with apple trees and bungalows is like an artist’s painted canvas. Constructed in 1872, St Mary’s Church, the beautiful wooden church with its old graveyard stands as a reminder to a bygone era. One of the oldest churches in India, it houses a dazzling stained glass window and an array of cedar - sculpted pews. Near to this is the Gorton Mission School established in 1843. Just 2 Kms from Kotgarh, it is dedicated to the diety Deo or Deota. Constructed in Shikhar style, it has beautiful architecture. It is situated 5 Kms From Kotgarh. The famous Nag Devta temple built along the lake, but not open to outsiders. Every month of June, a fair is held near the lake, where local artisans and craftsmen display their wares. 15 Kms from Kotgarh is Hattu peak, situated at 11,000 ft near Narkanda. Offers a wonderful trek, it takes minimum two hour trek to reach this peak from Narkanda. On the way one can see many flora and fauna. Also can enjoy the mesmerizing beauty of the Pir Panjal and the Dhauladhar ranges of Himalayas from the peak. During winter and spring, the peak is covered with a with a thick blanket of snow. At the top there is small temple dedicated to Hatu Mata (incarnation of Kali). Every year a fair is organized here in the month of May.